Alice was born in Beijing but left for London at the age of 7, returning when she was 21. She is a graduate of English Literature, Durham University, but her Chinese cadre grandparents were the main force behind her education. 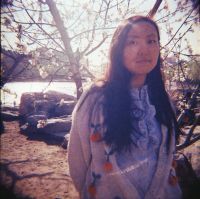 She has translated poems by Sen Zi for the Copper Canyon Press poetry anthology Push Open the Window and has an ongoing contract with a Chinese publishing house to translate The Letters of Shen Congwen. Her translations have appeared on the website of Granta magazine, Chutzpah!, Asymptote, and Words Without Borders. She is currently translating Han Han's next non-fiction book, compiled by her and her co-translator Joel Martinsen for Simon and Schuster. As of September 2011, she is the managing editor of Pathlight: New Chinese Writing, a new English literary journal jointly produced by Paper Republic and People's Literature. The second issue of Pathlight: New Chinese Writing, themed “The London Book Fair,” is now downloadable as Epub (most devices including Apple) and Mobi (Kindle devices) by following this link! The kind of writing that is coming out of China right now include chick-lit, family-orientated dramas, tales of escape from the rural to the urban, of grievous policies in the countryside, science fiction, and historical epics. It’s possible that we cover all of those topics in the new issue. The English edition of People's Literature, the oldest magazine in new China, is out! We've named it Pathlight: New Chinese Writing, and it can be purchased on Amazon.cn, from Hong Kong and elsewhere, too. This is China's first literary magazine edited by a bunch of foreigners, and it has cultural significance, too. Officially, this is how Xinhua presented it. The editor-in-chief of the Chinese edition is Li Jingze (李敬泽) and his assistant is the writer Qiu Huadong (邱华栋), as many know. On the English side, myself, Eric Abrahamsen, Canaan Morse, Brendan O'Kane and Joel Martinsen have all edited, and the first edition features translations from Brian Holton, Martin Merz and Jane Weizhen Pan, Andrea Lingenfelter, Denis Mair, Lucas Klein, Fiona Sze-Lorrain etc. Granta magazine was established in 1889 at the University of Cambridge, named after the river that later became the River Cam. It has a reputation for being highbrow and presciently published 12 future Booker winners and various Nobel laureates. Chutzpah! magazine (天南) was established by art curator and poet Ou Ning (欧宁), and so far has only put out four issues. Like Granta, Chutzpah! themes their issues － they are Agrarian Asia, Universal Narratives, Mapping Poetry and Vision of Eros. Here is a transcript taken from my notes － readers are welcome to listen to the video linked at the bottom. John Freeman: Granta was established more than 100 years ago by students at Cambridge. Then American Fulbright scholars restarted it. Magazines are like blank canvases; without it artists can’t do anything. Giving writers a space depends on who is available at the time and our ability to find them. Granta’s mission is to find the right writers. We’ve published Czech, Latin American and French writers amongst others, including Kundera, Llosa, Márquez. I was really excited when I saw the title Girl in Translation (published by Penguin), but I didn't know it was going to be a book of literal translation. The author of Girl in Translation is Jean Kwok. The description on *Girl in Translation is as follows: "When Kimberly Chang and her mother emigrate from Hong Kong to Brooklyn squalor, she quickly begins a secret double life: exceptional schoolgirl during the day, Chinatown sweatshop worker in the evenings." I wonder if when Chinese people say 小心, they really think of small hearts, or when they say 放心, they think of release. With no disrespect for the Kwok, these are just general questions that are interesting.